Denver Big Air was a Big Hit! 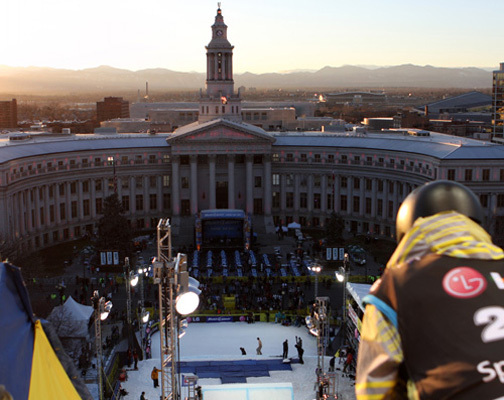 Denver Big Air was a ski and snowboard competition that was held Tuesday and Wednesday night in Civic Center Park. A huge ramp that was 101 feet tall, 300 feet long, and 80 feet wide was constructed to showcase some of the best skiers and snowboarders in the world! Tuesday night featured the skier and had about 7,000 people purchase tickets. The second night featured the snowboarding and sold about 14,000 tickets. The crowd was full of energy as they chanted the names of their favorite athletes and the backdrop couldn’t have been more beautiful. The jump framed the City and County building of Denver. Everyone was impressed by the event and is hopeful that it will return for a second season. If you missed it, don’t worry, it’s set to air on NBC this weekend.